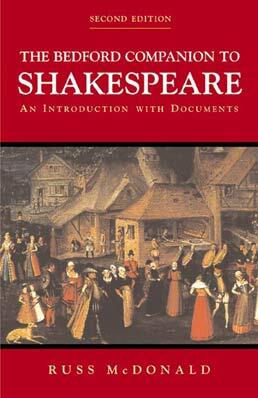 Using a compelling assortment of well-written, up-to-date background information and intriguing selections from primary documents, The Bedford Companion to Shakespeare delves into the topics most important to the study of Shakespeare in their full historical and cultural context. 5. "What Is Your Text?" What Is a Shakespearean Text? *Isabella Whitney, From "To the Maids of London"
Ben Jonson, "On My First Son"
Russ McDonald is Professor of English Literature at Goldsmiths College, University of London. Having taught at five American universities, he is the winner of multiple awards for distinguished teaching, including North Carolina Professor of the Year. For a decade he helped to direct the NEH-sponsored Teaching Shakespeare Institute for secondary teachers at the Folger Library, and his pedagogical commitment led to his publishing the widely-adopted Bedford Companion to Shakespeare. A specialist in Shakespeare’s poetic language, he has held fellowships from the National Endowment for the Humanities, the Folger Shakespeare Library, and the Mellon Foundation. His scholarly works include Shakespeare’s Late Style, Shakespeare and the Arts of Language, and other books and articles on Shakespeare and early modern writing and culture. In 2010-11 he served as President of the Shakespeare Association of America. He also writes regularly for Opera magazine.